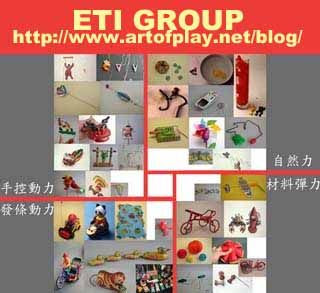 In the past toys were manipulated manually, using a variety of natural forces or materials for the toy to perform its function. Here we introduce a number of traditional “structural” or “functional” toys, dependent on manual control, air, water, flexible materials or clockwork springs, providing a contrast to modern toys dependent on batteries and electronics. People know how to use their hands to complete certain tasks almost as soon as they are born and playing games is no exception. Manual control is instinctive and the beginning of all forms of control. Children playing outdoors are most able to appreciate the power of nature. In this way, playing games is also useful in helping them understand natural phenomena and scientific principles. This involves using the potential nature of specific materials to produce reactive or kinetic responses to create the energy needed to propel a toy. The materials most often used are bamboo and rubber bands. Most toys in this period were operated manually and usually made from natural materials. These later evolved into mass-produced metal toys, at which point “clock\work spring” became one of the key sources of dynamism in toys. This entry is filed under A 游藝學（遊戲學）總論, A1.玩-物玩. You can follow any responses to this entry through the RSS 2.0 feed. You can leave a response, or trackback from your own site.